Sweet flyer by Ross Menze of Estrogen Highs/Iron Hand! Be sure to check out the special 116 Crown cocktail Dada Punch! 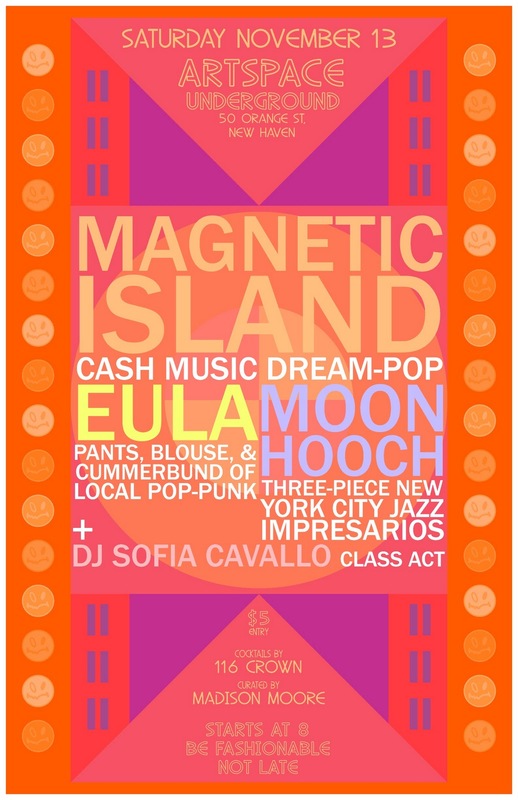 Performances by Brooklyn-based dream-pop duo Magnetic Island, local indie-pop band EULA, and New York City jazz impresarios Moon Hooch. Drinks provided by 116 Crown. The Underground is curated by Madison Moore. The Artspace Underground is an after-hours series bringing cutting-edge performances, experimental time-based art, and alternative music to the gallery. This Underground is set against the backdrop of Betwixt & Between, group exhibition of contemporary short videos that inject the ordinary domestic landscape with existential content and psychological slippages, organized by Artspace Curator Liza Statton.